University Foot and Ankle Institute (UFAI) has been honored as the Best Foot and Ankle Surgeons in California. This year’s Top Doctors Award places the ten-location practice ahead of the hundreds of other foot and ankle specialists practicing in the state. What, you may ask, has allowed UFAI to stand head and shoulders above the rest? There’s more to it than just being impeccable surgeons. It’s also a team that surrounds the doctors and their patients that are there to help. It’s gifted physical therapists who personally guide their patients through their individual recoveries. It’s a trustful environment for patients from all walks of life who learn that their treatment plan is always personalized to them, their lifestyle and their physical condition. It is also worth noting that two physicians from University Foot and Ankle Institute also just received accolades from Los Angeles Magazine, being chosen among the Best Doctors in Los Angeles for foot and ankle medicine. “It brings to light how much the integrity and dedication of our doctors brings to the field of foot and ankle care,” said Gary Briskin, University Foot and Ankle Institute’s co-director. 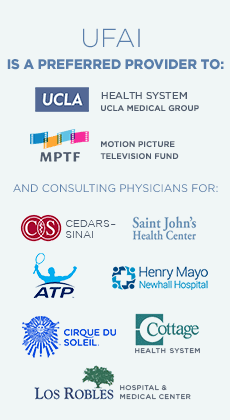 University Foot and Ankle Institute boasts 10 convenient locations throughout Southern California, many that feature surgical suites, MRI, CT scanners and even on-site physical therapy clinics. Two more locations will be opening in early fall 2018 and another will follow in Northern California in the fourth quarter of this year. Previous: Is Microfracture Obsolete For Osteochondral Lesions Of The Talus?